Stansbury’s Josh Oblad (left) and Carson Belnap battle for the lead during the boys’ 800-meter run at the Tooele County Schools Invitational track and field meet on Wednesday at Tooele High School. Belnap won the race by .39 seconds over Oblad, with both recording personal-best times in the event. Tooele’s Jared Downard pulls ahead of teammate Justin Rogers to win the boys’ 300-meter hurdles at the Tooele County Schools Invitational on Wednesday at Tooele High School. Grantsville’s Jenna Ussing competes in the girls’ 300-meter hurdles. 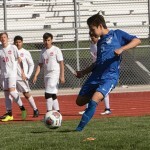 Once the rain gave way to warm, sunny skies on Wednesday afternoon, it was time for Tooele County’s track and field stars to shine in the annual Tooele County Schools Invitational at Tooele High School, featuring athletes from Tooele, Stansbury, Grantsville, Dugway and Wendover battling for bragging rights — and state qualifying marks. Tooele’s girls and Stansbury’s boys came away with the team titles on a day filled with impressive performances. The Tooele girls won nine events in all, with Makenna McCloy dominating the 100-meter dash (12.73 seconds) and 200-meter dash (26.06). Emma Stuart set a new personal record by winning the 400 in 1:03.19 and Holly Johansen won the 1,600 with a PR of 5:47.03. Sammy Thomas won the discus with a personal-best mark of 123 feet, 8 inches, and Aysha Lewis had a PR in the high jump of 4-10 to win the event. Rachel Thomas won the 800 and the Buffs also won the 4×100 (50.55) and 4×400-meter relays. 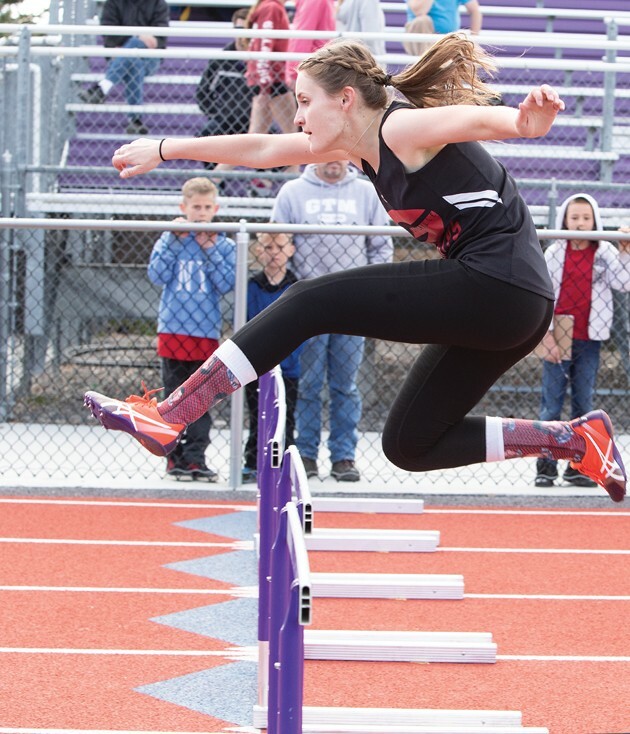 Other top-three finishers from Tooele included Bailey Jeppesen (second in the 100 hurdles, 17.33), Allie Miles (second in high jump, 4-8), Nizhone Tso (third in the 100 hurdles in 17.96 and the 300 hurdles in 51.99) and Lewis (third in the 100 with a personal-best 13.39 and third in the long jump at 16-2 1/2). Grantsville’s girls tied with Stansbury for second place, winning four events. Erin Hurst won the 100 hurdles with a personal-best time of 17.18, while Jade Garcia (110-10 in the javelin) and Ashlee Edwards (17-6 in the long jump) also set PRs. Sarah Kurtz won the 3,200, though official times for some events were not available at press time. Hurst also finished second in the 300 hurdles with a PR of 51.98. Chloe Gowans finished second in the javelin (93-3) and Danielle Hunsaker was second in the long jump (personal-best 16-8 1/2) and third in the 200 (27.03). Callie Killian ran second in the 800, Lindsey Palmer was third in the 1,600 (personal-best 5:59.20), Bailee Hill was third in the shot put (29-4) and Lynae Echavarria was third in the high jump (4-6). The Cowboys finished third in the 4×400 relay. Stansbury’s effort was led by Kayla Alvey, who won the 300 hurdles in 49.56, and Mackenna Sargent, who won the shot put with a mark of 33-1 1/2. Maame Johnson finished second in the 100 with a PR of 13.30; Aubree Cheney set a new PR in the 200 with a second-place effort of 26.84; Jadyn Gagnier was second in the 400 in a personal-best 1:03.59; Katelin Chipman was the runner-up in the 1,600 in a personal-best 5:49.09, and Faythe Evans was second in the 3,200. Stansbury also finished second in the 4×100 (52.88) and 4×400 relays. Mallori Britton (personal-best 1:09.00 in the 400), Brooke Call (800) and Ashleigh Olsen (93-0 in the javelin) had third-place finishes for the Stallions. 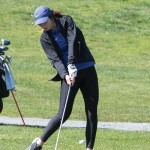 Wendover had several impressive performances, led by a pair of second-place finishes by Adriana Delgadillo in the shot put (30-2) and discus (99-3). Diana Solano finished third in the discus (personal-best 95-11), and Jenevie Suarez was third in the 3,200. Silas Young (11.12 in the 100 and 22.97 in the 200) and Jared Brown (PRs of 49-10 in the shot put and 151-6 in the discus) led the Stansbury boys to a team title with multiple event wins. 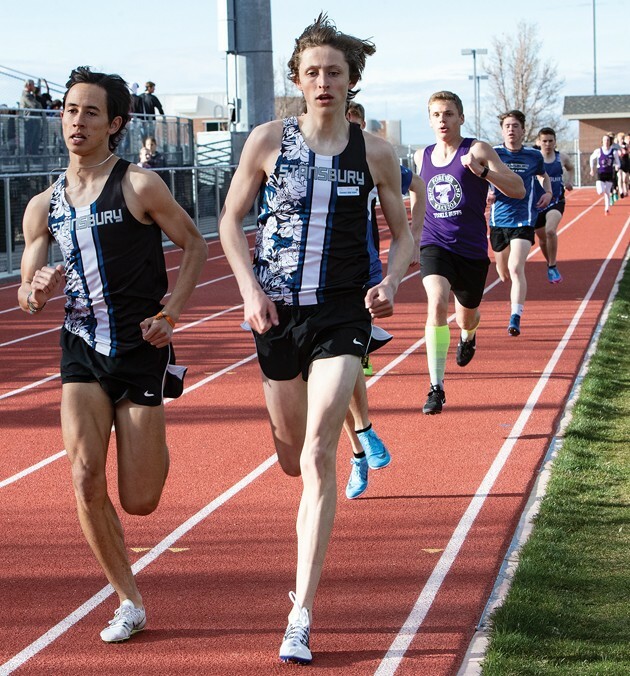 The Stallions also got individual wins from Brenden VanCooney (personal-best 51.98 in the 400), Carson Belnap (personal-best 1:59.35 in the 800) and Isaac Nelson (1,600), along with a victory in the 4×100 relay (43.48). 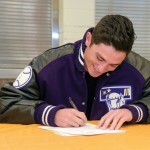 Stansbury’s depth was a major factor. Jet Richins was second in the 200 (23.62) and third in the 100 (11.50) and Dillon Carpenter was second in the shot put (personal-best 40-3) and third in the discus (personal-best 119-0). Xander Littlefield (52.07 in the 400), Josh Oblad (personal-best 1:59.74 in the 800), Jeremy Ruebush (1,600), Chandler White (personal-best 142-10 in the javelin) and Payton Didericksen (personal-best 19-5 in the long jump) all finished second in their events. Trevor Jensen (personal-best 2:06.29 in the 800), Talmage Ricks (1,600), Miles Howa (personal-best 46.07 in the 300 hurdles) and Jay Mackay (132-9 in the javelin) were third-place finishers. 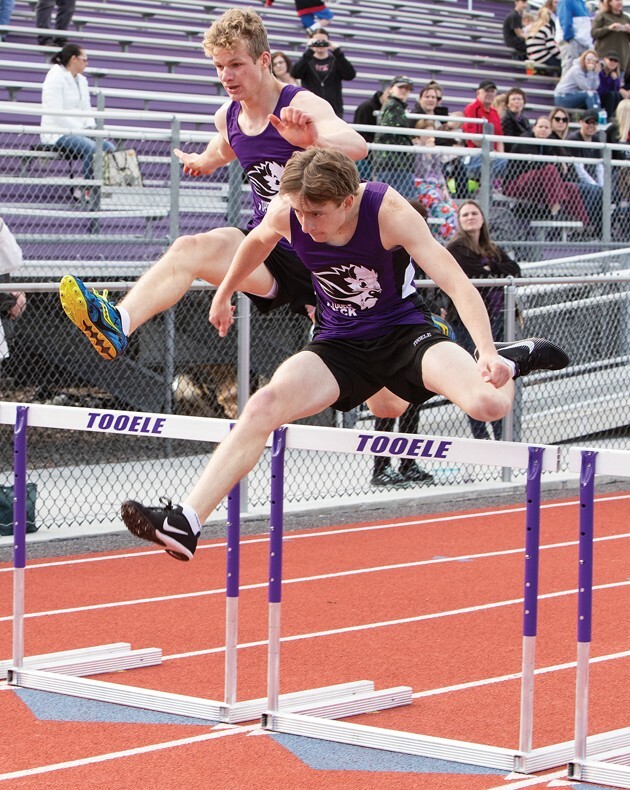 Hurdlers Justin Rogers and Jared Downard led Tooele to a second-place team finish. Rogers won the 110 high hurdles (15.91) and was second in the 300 hurdles (42.90), while Downard won the 300 hurdles (42.76) and was second in the 110 (personal-best 16.35). Gavin Ware set a PR of 19-7 to win the long jump and tied for second in the high jump (5-6), and Preston Pomikala won the 3,200. Aaron Pectol (personal-best 11.35 in the 100) and Cameron Simko (personal-best 123-5 in the discus) finished second in their events for the Buffaloes, as did the 4×100 (44.04) and 4×400 relays. Tabor Shepard (personal-best 24.32 in the 200) and Cameron Dutson (3,200) recorded third-place finishes. Grantsville’s third-place effort was led by Daltyn Peasnall (personal-best 150-10 in the javelin) and Jeffrey Yadon (6-0 in the high jump), as well as a win in the 4×400 relay. James Limburg was second in the 3,200, and Darin Sandberg (personal-best 55.18 in the 400), Paongo Melekiseteki (personal-best 18.12 in the 110 high hurdles) and Branson Yager (personal-best 39-6 in the shot put) each finished third. Dugway finished fourth in the team standings. Seth Ryan tied for second in the high jump at 5-6 and Austin DeGraffenreid was third in the long jump with a personal-best leap of 18-8 1/2.